People shift from agriculture and cattle rearing to goat rearing because goats can survive in harsh environment and still provide good profit. Since goats were domesticated 10,000 years ago, they have been poor people’s most reliable livelihood insurance. In India, goats are the most reliable source of earning a living in ecologically degraded areas. The reason: a goat has everything a poor or a person in emergency needs: low investment, high and consistent returns and near liquid monetary status. Apart from the fact that goats can survive in harsh environments, what adds to the profitability of rearing goats is that they are also prolific breeders and have a good survival rate in drought-prone areas. They are able to conceive and breed twice a year. Most of the time they give birth to twins, sometimes to triplets or quadruplets. This is why farmers, especially small and marginal in ecologically fragile areas, shift from agriculture and cattle rearing to goat rearing. In a two-day conference, starting today, the International Fund for Agricultural Development (IFAD) is partnering with the Centre, the Bill and Melinda Gates Foundation and Agri-solutions, to discuss how the goat sector can be improved in rural areas, specifically in Uttar Pradesh, Bihar and Odisha. International technical experts and national policy makers will discuss how building a vibrant goat sector in India is critical to reducing poverty, meeting the Sustainable Development Goals and Prime Minister Narendra Modi’s aim to double farmers’ income by 2022. Raising goats is an income-generating activity that has enormous potential to increase incomes and improve nutrition for resource poor households, especially in remote, tribal and ecologically vulnerable areas. Giyasilal Saini, a poor farmer in semi-arid Alwar, Rajasthan was struggling to feed his family as a pond that irrigated his field dried up. Until, he started following the example of farmers from Jaitpura village who shifted to goat-rearing, and in three years Saini’s herd grew from 20 to 80-strong. India has the second largest global goat population and has the potential to increase its role and profits in the lucrative global goat market. Many household are surviving on income from goat-rearing. In fact, when the contribution of the agriculture and allied sector to GDP declined from 55 per cent in early 1980s to 21 per cent in 2009, the share of livestock within the agriculture and allied sector increased from 18 per cent to 23 per cent over the same period. 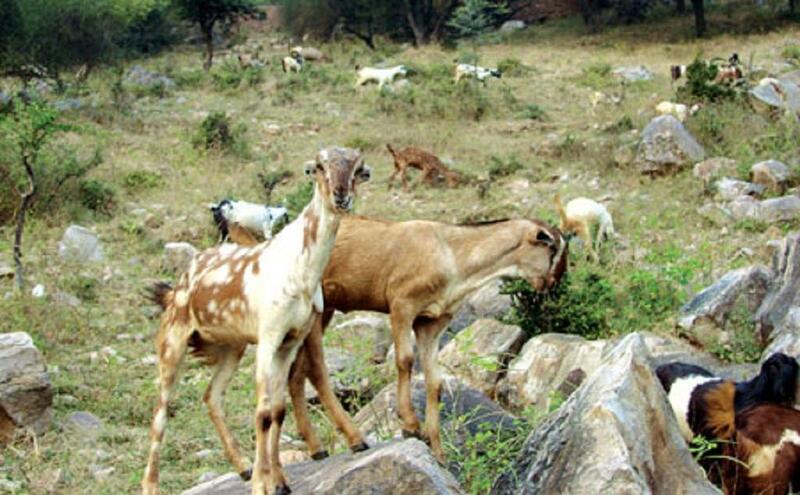 Goat rearing is a lucrative enterprise as almost 70% of investment depends on grazing in shared resources, such as wastelands, common grazing lands and forests. However, with increasing urbanisation, encroachment and land degradation, the pressure on grazing areas is too showing. With just 7.87 per cent of its area as forest and 4.98 per cent as permanent pastures and other grazing land, Rajasthan, home to the second largest livestock population in India, is especially vulnerable. Demands on forests and change in cropping patterns are contributing to this pressure. In fact, Rajasthan, which has the highest population of goats, saw an increase of just 1 per cent in their numbers during 2002-2007. Down To Earth covered this issue and pointed out that defining the ‘desired grazing pressure’ within which goat-rearing can be economical is important to sustain grazing. The backup economy is also seeing a slow death because of the state’s narrow-minded policies and nationalist focus on the cow (the state government appointed India’s first cow minister in 2015). With shrinking grazing lands, domestic animals are facing a severe shortage of fodder. By 2016, only 62 million tonnes of fodder will be available as against the demand of 84 million tonnes.